A few months ago, we received a wonderful letter from a Jeweler’s mother sharing about how Premier had enriched her daughter’s life, as well as her own. On this Mother’s Day weekend, we asked that Jeweler, Melanie McGarry, in Nevada to share about how she’s enriching lives through Premier. she was saying the most random things, making me laugh and calm down. I am proud to say that I accomplished both Quick Start 6 and 9 and later achieved Joan’s Rookie Club, a goal that I was determined to meet. I am a full time college student at the University of Nevada – Reno studying to be a teacher. Premier is helping me pay my way through the rest of my schooling. I did not realize what an impact Premier had on my life until October of 2013. One day, I got a text message from one of my friends asking, “Is your mom okay?” My mother is an employee of Bank of America and my friend told me about a robbery at the branch where my mom had worked three months before. After reading more about the robbery online which resulted in a fatality, I was in tears because we had family friends there. I was really down about this, grieving with them about what had happened. Then, I realized that I could do something. I decided to do something I heard was done for Sandy Hook Elementary School. I gathered 15 Token of Love necklaces from my Premier Family to give to all the employees at that branch that were affected by this tragedy. Just when I had this campaign started, another tragedy hit. A student at Sparks Middle School shot a teacher, Mr. Landsberry, when he tried to stop him and then several students on the playground one morning before turning the gun on himself. I cried as I thought about what I might have done if I were there. I kept thinking about how all of those teachers must feel, how the parents of all three children feel, and how the family of Mr. Landsberry feels. I started asking more people to donate Token of Love necklaces. I asked Premier Family, my family, friends, hostesse s, and guests to purchase a necklace to be donated toward this cause, and in return, I would take the profit that I made to buy another one. Now, I not only needed 15 necklaces for Bank of America, I also hoped for 80 more necklaces for the teachers at Sparks. 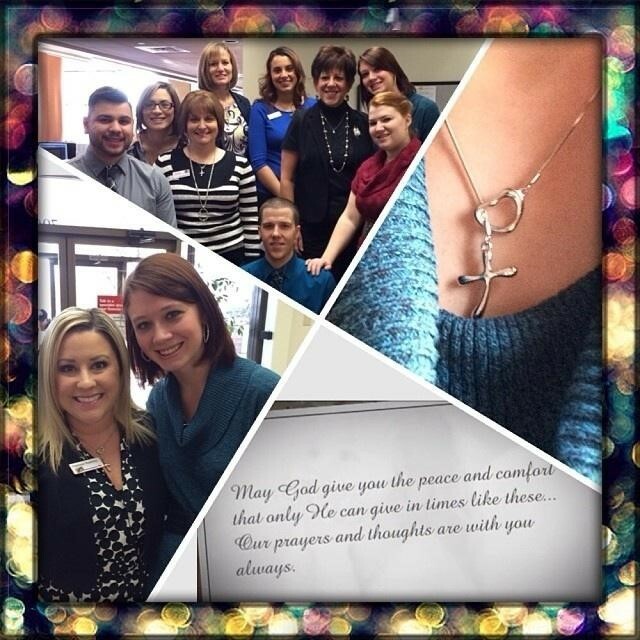 In just a few weeks, my mom and I were able to presents the necklaces to my friends at the bank. They were all so thankful. We cried together. Still today, some of the employees will show me that they are wearing their necklace. In January, I started to loose hope that I’d be able to collect enough necklaces for the teachers. I only had about 50 necklaces. My mom and I went to Regional Rally and had a great time. Rally motivated me to not give up on this campaign just yet; I needed to finish it. Not for me, but for all of those teachers and the families of the victims. While I was encouraged at Rally, I had no idea how much the day had affected my mother. About three weeks later, she told me that she had written Andy and Tim. When I read her email, I cried. I wanted to take a moment to thank you for everything your company stands for and provides. I am the proud mother of one of your jewelers, Melanie McGarry. Gifts come in many forms. The gift of the Premier Family was totally unexpected. Melanie started with Premier Designs the end of June 2013. Before joining Premier, she was still a shy introverted young lady. I have always been proud of her and her choices in life, however; joining premier was one of the best choices that she has recently made. She has blossomed into a proud, self-confident, professional woman with the highest integrity. She looks at Premier not only as an opportunity to help her with finances for school but as a network of family for support and growth. In six months of being with Premier, she has received numerous recognitions. Her next goal is becoming a leader. All of this because she embraces her Premier family. She recognizes that without believing in herself and God, none of this would be possible. Imagine how all of this experience and knowledge is going to aide her in her career as a elementary school teacher and as an adult in the fast paced world. Yes, I do “Count it all Joy“! I was able to attend the Regional Rally 2014 with her. I thought I was going as a guest. As the day progressed, I realized that I was meant to be there. I was taking notes and getting more than I ever imagined. My heart was filled. In addition to everything she has received from Premier, she has learned that it is better to give than receive. She campaigned to get the necklaces donated for two tragic shooting events in our community for which she felt compassion. This will long be remembered as a symbol of love and kindness. So in summary, I thank you again for your time for reading this letter. I just wanted to tell you “my Premier story” – the mom version. The story you may not hear about too often. The story is because she believes in the foundation that your company is build on. The story of pride, happiness and serving others. We hear too often of the negative and the “woe is me” stories, this is just simply saying thank you for building a company that has such great morals and values, that millions of women sing your praise. I can see why! So from this mom, I say THANK YOU and GOD BLESS you all. In February, I took 80 Token of Love necklaces to the principle of Sparks Middle School to give to each of the teachers along with a note of encouragement. I was finally able to accomplish this goal, with the help of my fabulous hostesses, guests, friends, family, Premier jewelers. Thank you to all of those that helped and supported me. So, as I sit here and look back at the last 8 months of my journey, I realize all of the gifts that Premier has provided to me. By gifts I do not mean free jewelry, certificates, charm bracelets; I mean the gifts of life: wisdom, leadership, direction, courage, compassion, confidence, and determination. These gifts are valuable and have allowed me to share with others. I can see that by serving my hostesses, that everybody wins in the long hall. I have developed skills that I never knew were possible and self-confidence in areas where that I used to doubt. My Premier family, as well as my own family, provides me strength and support on a daily basis. I can see JOY in everything that I do and as I continue to move forward with my Premier journey, I will continue to always pay it forward. God bless such a beautiful young woman like you that has her priorities right in life. Reading this blog was a joy to me. You obviously love God, your mama, and people. You are goal driven and you are a self starter. Keep up the fantastic work. You are making a positive difference in this world and that is the most important thing we can do.